Today, as is tradition in East Hollywood on the Sunday before Labor Day, the DEFISAL (Desdile de Independencia Salvadoreno), or El Salvadoran Independence Day parade, rolled by. It celebrates El Salvador’s independence from Spain in 1851 (Mid-September appears to be the perfect time of year for Spanish colonies to revolt, isn’t it? ).The nearly two-mile-long parade ran through Santa Monica Blvd. from Van Ness in the west to Vermont, where it headed south for a few blocks and disassembles after turning right on Monroe Street in the LA City College campus. 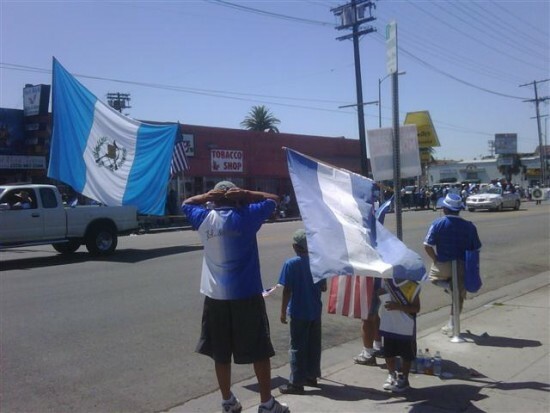 Though the parade’s organizers are based in the Pico-Union district, East Hollywood has a large and visible Salvadoran community, especially along Santa Monica Blvd, where bakeries and pupuserias line the street – right alongside Armenian businesses and shops run by members of other immigrant groups. But having lived here all my life, there’s no visible tension between the groups. Everyone seems to have the same needs and concerns. That’s how we roll in E-Ho! In previous years, two parades from rival and competing Salvadoran community groups took place on separate weekends in early September. But it seems either community solidarity (or budget woes from the smaller group) prevailed.